EBBA began in 2003 with the archiving of the single largest collection of black-letter broadside ballads of the seventeenth century: over 1,800 ballads in the five volume Pepys Collection at Magdalene College, Cambridge (for more on the evolution and makeup of EBBA see About Us). Our next project was to archive an only slightly smaller collection of some 1,500 ballads: the Roxburghe Collection at the British Library. 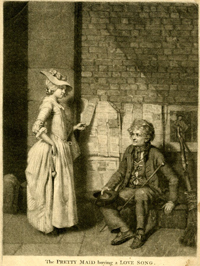 We have also archived four collections from the National Library of Scotland, including the important Crawford Collection; as well as the Euing Collection of 420 black-letter broadside ballads at the University of Glasgow, Scotland; and some 600 ballads that are loose or from various collections, including the Britwell, Bindley, and Bridgewater, at the Huntington Library, Pasadena. We are currently working our way through all early modern broadside ballads held at the Houghton Library, Harvard University. Our ultimate goal is to archive all surviving black-letter broadside ballads from England’s heyday of the printed ballad in the seventeenth century (when woodcut ornaments, printed tune titles, and black letter ruled). We estimate the number of such broadside ballads to be between 11,000 and 12,000. EBBA, however, will necessarily include earlier and later ballads as many collections are expansive in historical range, and extant sixteenth-century ballads, such as the Huntington's Britwell collection, are very rare. Still, as a matter of funding and time constraints, we will likely also have to restrict our purview to only portions of those larger collections that cross later centuries; otherwise, EBBA will become impossibly gargantuan. At all times, then, we prioritize the archiving of those collections and those parts of collections that privilege seventeenth-century ornamental black-letter broadside ballads. Other important collections of ballads that we have our sights on for future archiving include: the sixteenth- and seventeenth-century broadside ballads in the library of the Society of Antiquaries, London; holdings at the Chetham Library, Manchester; the Manchester Central Library; and, from the British Library, John Bagford’s three volume collection,Narcissus Luttrell's three volume collection, and the Huth ballads (which, with the Huntington's Britwell collection, belonged to William Fitch).